Meet Killer. Killer is not my cat. Most of the cats I see roaming around my street are feral cats, but Killer is the indoor/outdoor cat belonging to my neighbors two doors up from us. 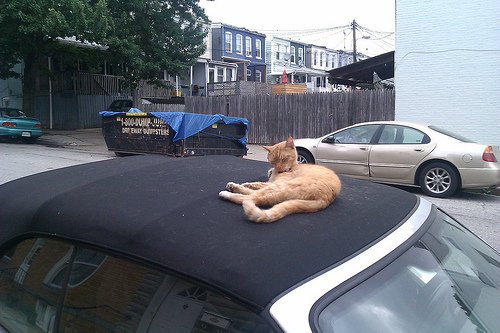 He can often be found hanging out on top of the cars on my street as you see in the above picture. Killer is super friendly and will run after people to pet him. Everyone who lives around here knows Killer, and that is what is making me happy today. I had kind of a crappy day at work. Nothing big happened. It was just one of those days. When I was driving down my street after work looking for a place to park Killer was hanging out on top of someone’s car as he is wont to do, and I saw someone walking down the street stop to pet him and say hi. I love that Killer has kind of become the neighborhood cat, and I broke out into a big grin seeing this guy interacting with him. It was the only thing I could think of that made me smile all day, which is why Killer is being featured on today’s blog post. Killer is so well loved even one of the regular UPS men stops and pets him. I met Killer once – super sweet and eager to say hello – with a bird in his mouth. He earned his name!